The West Kootenay region definitely has its own flavor, and the golf courses and golf resorts throughout this part of British Columbia are no different. There are kid-friendly municipal courses of nine holes and there are championship golf resorts where golf carts whir quietly down immaculately groomed cart paths. The one thing they have in common is the natural beauty surrounding them on all sides in this well-treed part of the province with its sparkling lakes and mountain views. There are nearly two dozen different places to golf, so make a tour of it on the winding roads, or find a place to stay lakeside and get to know the local course. This summer, the top 150 senior men in the province will be competing in the BCGA Senior Men’s Provincial Championships at Christina Lake Golf Club from July 21 to 24. Dave Dale is 89 years old, a Second World War veteran and founder of a successful business. He’s also an amazingly decorated golfer. 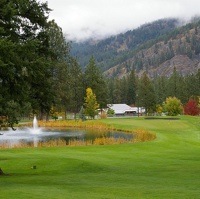 Some excellent end-of-season play can be found at what has been called the “best-kept golf secret of the Kootenays”.